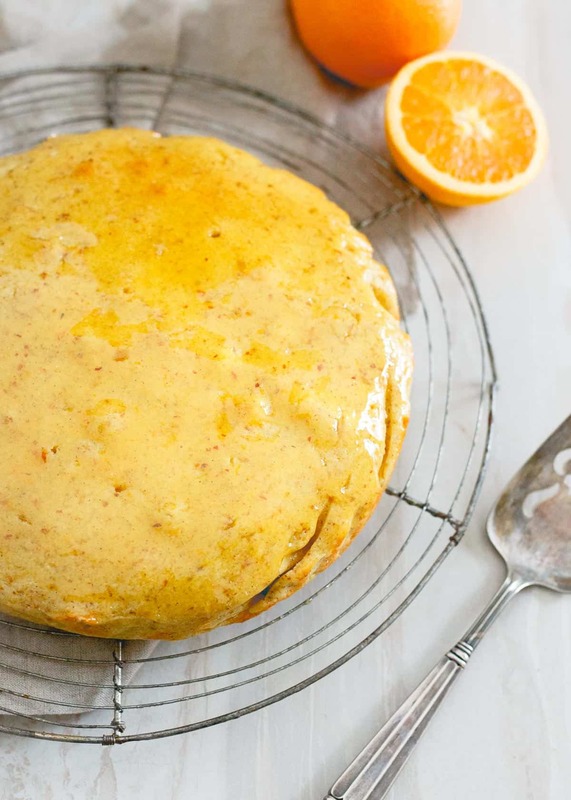 This glazed orange cardamom cake is a wonderfully simple dessert bursting with winter citrus and spice. It’s moist, hearty texture and sticky glaze make it perfect with a cup of tea. Car-da-mom! Can I get a ‘hell yeah!’ for the most amazing spice out there? Honestly, if I had to pick only one spice to bake with from now on, it’d be the amazingly aromatic cardamom, no contest. 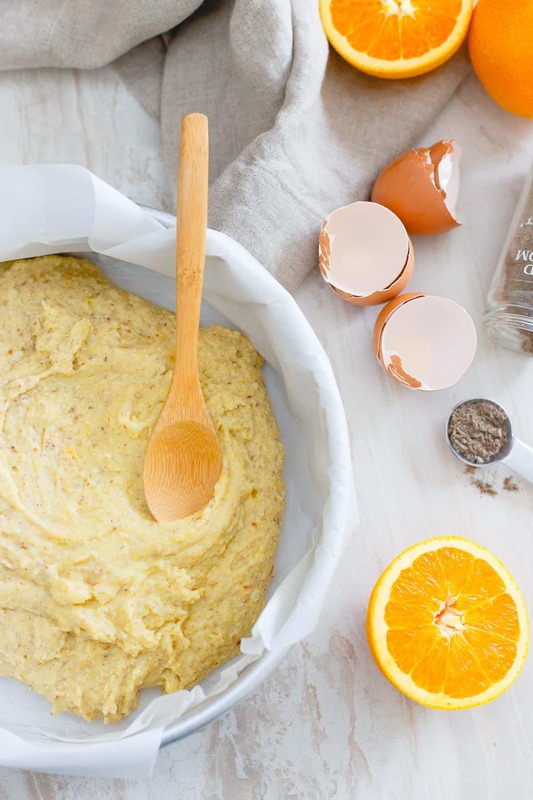 *This glazed orange cardamom cake recipe is sponsored by #JuiceCentral and the Healthy Aperture Blogger Network. When I was a kid, we’d make the trek down to White Plains (about 30 minutes outside NYC) to this Indian restaurant called the Bengal Tiger maybe 3-4 times a year. Somehow my dad discovered this hole in the wall years earlier, made quick friends with the maitre d’, Samson, an eerily tall and large Indian man who he’d practice his declining Hindi pleasantries with and refused to go anywhere else to eat Indian food no matter how highly recommended the place came. He insisted Bengal Tiger was the best, most authentic Indian cuisine around (even though there were many much closer to where we lived than this one) and once inside, we’d start with all the appetizers he grew up eating as each bite of samosa would bring him back to his childhood in Calcutta. While the poori bread was a close runner up, Bengal Tiger night’s were all about one thing for me, the orange kulfi dessert. Bengal Tiger served it in an orange peel itself and I thought that creamy, ice cream-like deliciousness was the best thing in the entire world. While most 10 year olds would probably tell you some Duncan Hines cake mix in cupcake form, brownies, Rice Krispie treats studded with sprinkles or something equally as Americana (aka: processed crap) was their favorite dessert, here I was all about the sweetened condensed milk with rose water, cardamom, saffron and pistachios. At 10 though, I had no idea what it was that gave kulfi that very distinct and unique flavor profile. I just knew I liked it and any time I tasted something with cardamom for years to come, I’d immediately liken it to kulfi, still not recognizing it was the spice tying things together. I have no idea when I finally wised up to cardamom being the common denominator but ever since, it’s been a spice I can’t live without (I’ve been adding a tiiinnny bit more of it to the coconut bourbon coffee nog I’ve been sipping all season and loving it!) and despite it’s rather shell shocking price at the grocery store, it will always have a spot in my spice drawer as queen of the baking spices. So it should come as no surprise that cardamom was the ingredient in which this cardamom orange cake was built around. I wanted a simple cake. Something that could easily pair with a cup of tea. Something moist, and textured but also something so aromatic and flavorful like those orange kulfi desserts of my childhood that it could easily be put on a holiday dessert table. I bring a lot of food we can’t possibly finish to the gym or pawn off on Ulysses’ coworkers but sometimes, even though the last thing I want to do 3 weeks before a beach vacation in Mexico is eat an entire cake, I just can’t part with a recipe because it’s so perfect. This is one of those times. The sweetness from the orange, the aromatic cardamom, the incredibly moist yet textured (thanks to almond and cornmeal) crumb, the sticky glaze…it’s all just magical. 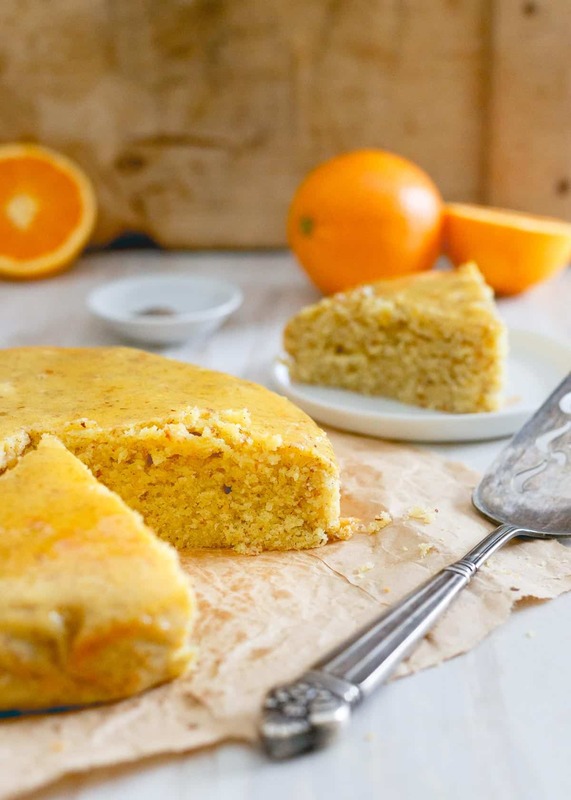 Using orange juice as well as the zest makes the orange flavor just pop in this cardamom orange cake. 100% juice contains all the same vitamins and nutrients (like potassium, vitamin C, folate and magnesium) as the whole fruit and no added sugar. Its natural sweetness also helped cut down on the overall need for sugar in the cake and the glaze. In fact, the glaze is made by reducing just the juice itself until thick and sticky, no need for additional sugar which is always a bonus. 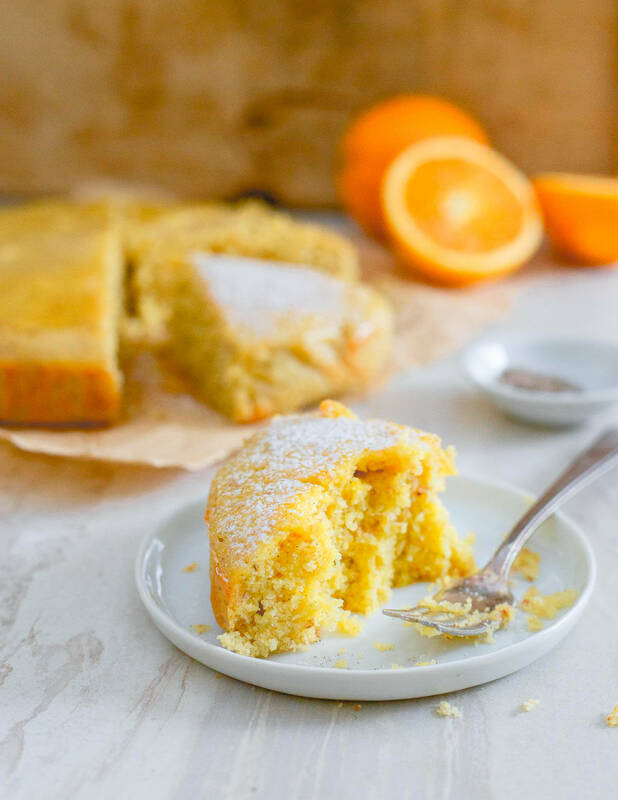 This glazed orange cardamom cake is a wonderfully simple dessert bursting with winter citrus and spice. It's moist, hearty texture and sticky glaze make it perfect with a cup of tea. Preheat oven to 350 degrees. 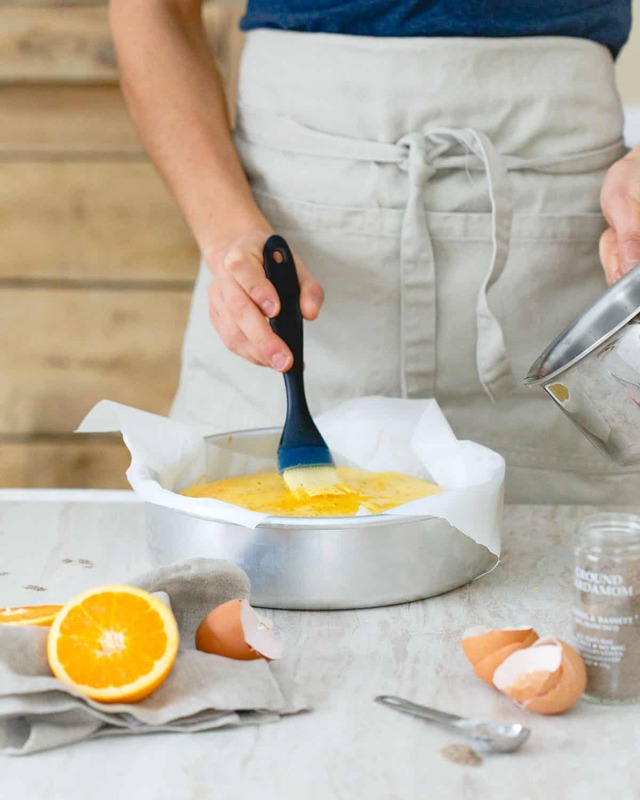 Grease a 9 inch cake pan with butter and line it with parchment paper (the butter helps the parchment stick to it, making it easier to pour the batter in evenly). During the last 5-10 minutes of baking time, add the orange juice for the glaze to a small sauce pot. Bring to a boil then simmer on low until thickened. Remove the cake from the oven and place on a wire rack in the pan. Brush the glaze on the top of the warm cake. Let it cool for about 15-20 minutes before removing from the pan and letting cool further directly on the rack. Make your own caster sugar by placing granulated sugar in a food processor and processing for 1-2 minutes until very fine but not quite powdered. While I usually make this apricot brandy cake (an absolute flavor stunner) for our family Christmas celebrations, this year things are changing and glazed cardamom orange cake will be on the table. I’m excited for the fam to taste it! Wow Gina, this cake sounds incredible. Cardamon is one of my favorite spices also. I use it quite often in my baked goods. I love the bold citrus flavor in this one too. During the winter I always look to citrus dessert to perk me up and remind me of summer. Thanks for sharing! 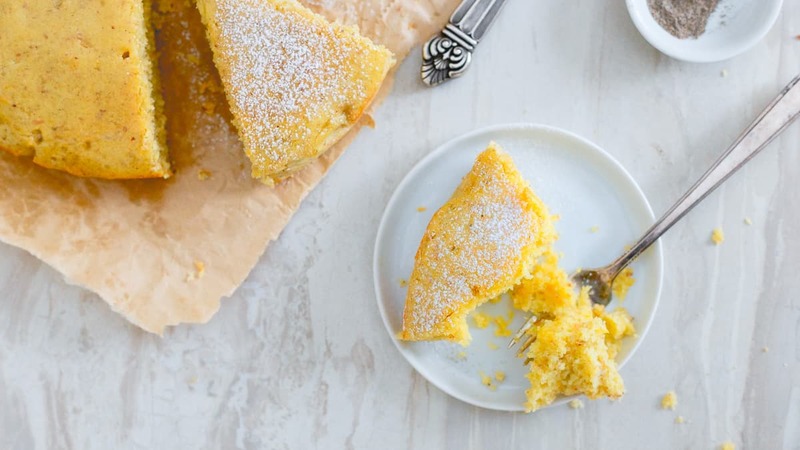 Bring on the citrus, this cake looks amazing! I love citrus with cardamom!! These photos are gorgeous! 1. This cake is gorgeous! 2. LOVE the addition of cardamom!! 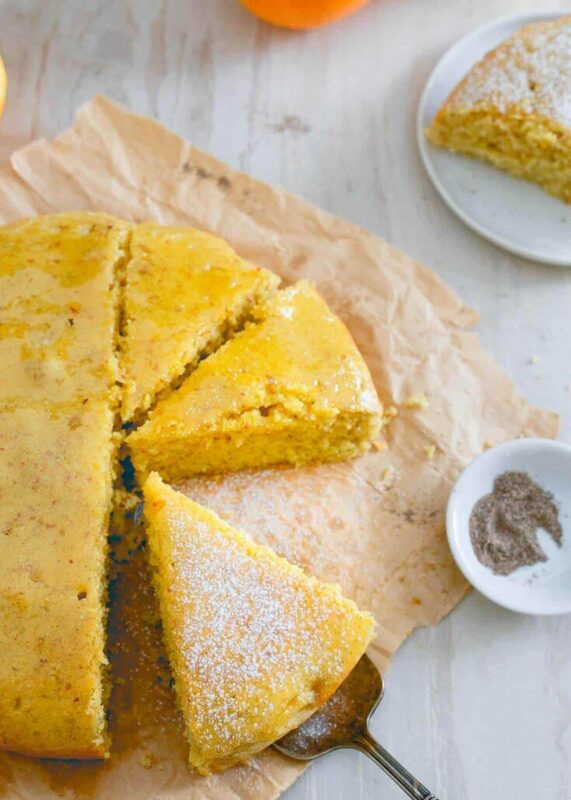 Is there a good alternative to the almond flour? Nut allergies in our family. If you can’t do any nuts/nut flours, I’d just use more cornmeal as the replacement. Haven’t tried it that way but it should work. But – how many EGGS? Ahh! thank you for catching that! 3 eggs. Recipe has been updated.